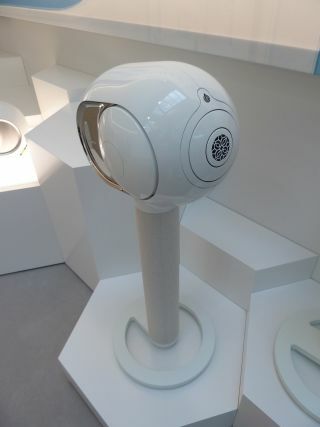 Devialet explains the technology behind its Phantom wireless speakers | What Hi-Fi? Devialet has revealed a lot more about the technology behind its ambitious Phantom wireless speaker at the Munich High End Show. This unit is available in two versions, differentiated by price and power output. The standard option is expected to retail for £1390. It has a power output of 750W and is claimed to have an SPL of 99dB. Move up to the Silver version and you'll pay £300 more, bringing the price up to £1690. The more expensive model is identifiable by the silver domes of the side-firing bass drivers - and the internal power increases to 3000W and pushes sound levels to 105dB. But the Phantom is more than just a pricey wireless speaker. Much of it is built on the analogue/hybrid amplification technology Devialet pioneered in its first product, the D-Premier. It's the combination of a low power, high-quality Class A analogue amplifier circuit and a muscular Class D module that makes the company's approach so unusual. Here the engineers have managed to shrink the innovative circuitry to make it small enough to fit into the unit's 12 litre casework. That space is shared with two side firing bass drivers and a front-facing co-axial unit. That casing isn't just a simple plastic moulding. The external surface is made of ABS, while the internal skin uses glass fibre polycarbonate. The casework is supported by an aluminium central core, which gives the unit its rigidity. It is possible to link up to 24 Phantom units at once. These can be used in single, stereo and multichannel configurations around the house. However, film fans shouldn't get too excited just yet as Devialet is still working on the module that decodes movie sound.